The Hotel Robert of Valverde, near the beach, has: free parking, free WI-FI and rooms with sea view balcony. Pets Allowed. 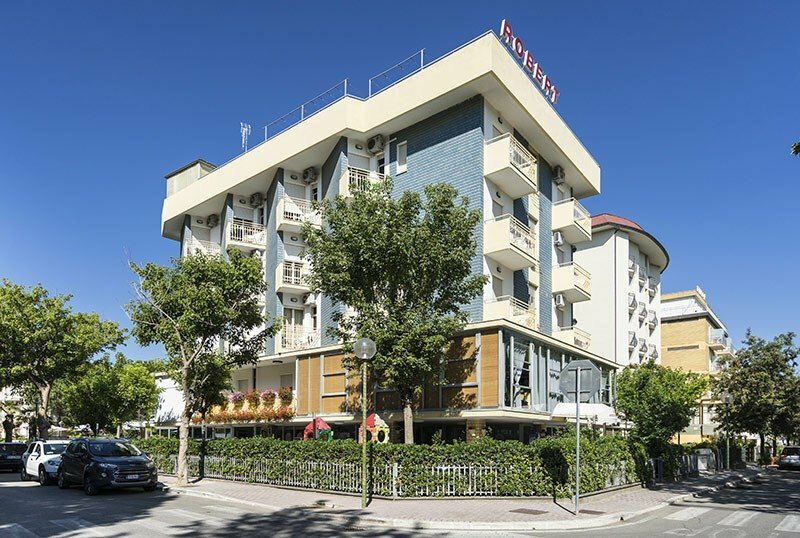 The hotel is located near the beach of Valverde, a small fraction of Cesenatico. The sea can be reached in less than 5 minutes. The rooms are equipped with balcony, safe, telephone, 40 "smart TV with digital terrestrial, WI-FI, bathroom with shower box or curtain and hairdryer. STANDARD: can be single, double, triple and quadruple with bunk beds. It has all the services listed above and a standard bathroom (no shower box). Air conditioning on request and for a fee. SUPERIOR: triple or quadruple with bunk bed, has a renovated bathroom with shower and air conditioning included. Shady garden with games for children, open-air porch, 25 bikes available, TV room, bar, elevator, entertainment for adults and children. PARKING: uncovered, inside the structure, subject to availability. AIR CONDITIONING: common areas and rooms. CONVENTIONS: beach, amusement parks, swimming pool (free admission to the outdoor pool 150 meters from the hotel), waterslide, organized excursions, free entry to the Maritime Museum. PETS: allowed of all sizes, with supplement for room sanitation. BREAKFAST: sweet and savory buffet dishes; fresh pastries, homemade desserts, yogurt and much more. LUNCH AND DINNER: choice of menu with three first and three second courses, meat and fish dishes every day and buffet of appetizers and vegetables. Water, wine, orange juice, cola at meals. OTHER: theme dinners are periodically organized. In hotel: strollers, entertainment, indoor and outdoor playground area, afternoon snack and paid pediatrician. In the room: cot for a fee. At meals: seats at the table, equipped kitchenette, bottle warmers, baby food and baby menus. On the beach: live entertainment, children's games. The hotel has an agreement with two lifeguards: Bagno Luca and Bagno Da Chi Burdel, both close and equipped with games, entertainment and many services. The prices of the price list are per person per day for weekly periods from Saturday to Saturday for a min. of 6 nights. Book by 01 May 2019 and receive a 5% discount on the total amount. Call now and book your beach vacation!